Dental Associates of Lodi provide “New Teeth in One Day” full mouth restoration services in Lodi, NJ. Call our office today at 862-247-8030 to learn more and schedule your appointment. This procedure is a unique implant solution that allows patients who are missing all of their upper or lower teeth to replace a full arch of teeth using only 4 to 6 implants as “anchors”. Also known as All on 4, this solution is an excellent way to achieve the look, feel, and functionality of natural teeth. Because the implants anchor the replacement teeth to the jawbone, they will not slip or rock like traditional dentures. And unlike standard dental implants, the implants used for this procedure are immediate-load, allowing you to go home with a brand new set of fixed teeth the same day the implants are placed! In addition to restoring functionality, strength, and stability, dental implants also halt or reverse the bone loss that occurs when teeth are pulled. This can alleviate the sunken look that is common among denture wearers. The implant supported full arch of teeth requires no plate on the roof of the mouth, allowing you to speak and eat with ease and comfort. Traditional dental implant procedures require multiple visits with multiple doctors at multiple locations. Here at Dental Associates of Lodi, we can achieve the same result under one team, one location and most importantly – one fixed cost. With the all-inclusive approach, our patients can leave the office with fully functioning teeth in one day. Generally, crowns, bridges and dentures last 5-10 years depending on a patient’s care of their teeth. Implants on the other hand are a lifetime solution for missing and failing teeth. Soon after your treatment, you will be free to eat your favorite foods again – just as you would with natural teeth. We invite you to call us today at 862-247-8030 to schedule your appointment. What are the benefits of “New Teeth in One Day”? How can you replace all my teeth with 4 or 6 implants? 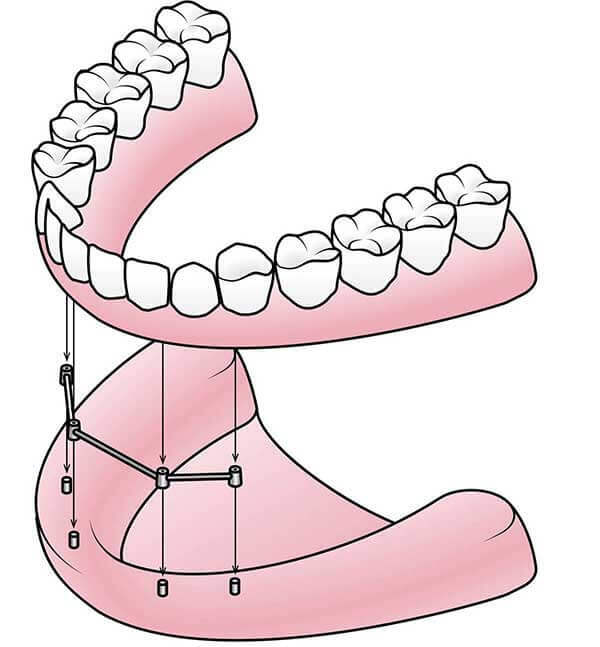 Careful placement and positioning of just 4 or 6 implants allows the implants to work together to support the weight of a full lower or upper arch of teeth. This is a well-researched procedure that has excellent results. In some cases, we may recommend additional implants for extra support, but this is relatively rare. Are there medical conditions that would disqualify me? Relatively few people are medically disqualified from receiving “New Teeth in a Day.” If you have an uncontrolled existing health condition, we may need to delay the procedure while your physician gets your health under control. We will critically evaluate every detail of both your dental history and your health history, and work with your primary care doctor if needed. Can I eat whatever I like? For the first couple of days, your mouth will likely be sore, so we recommend a soft diet. We also recommend that you avoid very tough, sticky, or chewy foods for the first three months, while the implants fuse with your jawbone. After that, you will find that you can eat nearly anything, even tough steak and sticky candy! It depends. Every dental insurance plan is different. Many now pay part of the cost for dental implants, but not all do. Our team will maximize your dental benefit and guide you the different financing options to help you to make the treatment affordable. Talk to our office staff to learn your out of pocket costs and the financing options we provide. Call us today at 862-247-8030 to schedule your appointment.